Window treatments are an important part of interior design. When choosing how to decorate your home, you’ll undoubtedly spend a lot of time considering the various options for window treatments. There are so many options available, from Custom Drapery, to blinds, to Roman Shades, and beyond. Once you start looking, it’s easy to fall down a rabbit hole of seemingly never-ending choice. However, that doesn’t mean that you’re always able to find what’s right for you. When you’re decorating your home, you want it to be perfect. Your home should be a reflection of you and be well-matched to your tastes and lifestyle. That means having everything perfect down to the last detail. Sometimes, standard window coverings that you find in showrooms and home improvement stores just aren’t good enough. 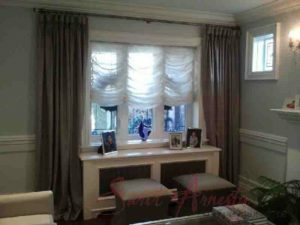 That’s why you should consider having custom window coverings designed and made for you home in the Toronto . There are so many types of window covering to choose from. You can have drapes for an elegant, bold look or blinds for more subtle appearance, but that’s not all. There are shutters, shades and more. If you’re finding it hard to choose, we’re here to help. We’ll explain the pros and cons of each one and their suitability for meeting your specifications so the decision is easier for you to make. Do you want something that opens and closes all by itself? We can make that possible by designing and manufacturing automated custom window coverings that you don’t need to adjust. You can control them with the touch of a button, and even set them on a timer so that they’ll move according to your schedule. As well as being extremely convenient, automated window coverings are safer and more energy-efficient. We’ll provide a range of fabrics with different colours, patterns and textures and help you to choose the ones that would best suit your home. When you buy window coverings from a store, you’re limited in the looks you can create. When you get them custom-made, you can get creative. The collaboration of your ideas with the imagination and expertise of our designer is sure to be a winning combination. However you choose to dress your windows, you need to make sure it’s a perfect fit. We’ll take care of that for you by measuring everything up and making it especially for the space you want. There’s no need to worry about getting it home and hanging it only to find that it’s not the right size, as is sometimes the case with regular window coverings from a store. We’ve got you covered. During our meetings with you, we’ll talk about exactly what purpose you expect your custom window coverings to serve. Whether your primary concern is to maintain privacy, block out sunlight, reduce noise, provide insulation, all of the above, or simply to look beautiful, we’ll take that into consideration and design something just for you. Once you’re comfortable with a solidified idea of what you’re looking for, we’ll put together some designs to fit your specifications and pitch them to you. We’ll keep making adjustments and improvements until you’re absolutely satisfied with your results. Then, we’ll craft them just for you. When decorating your home, there’s a world of choice. Whether you want to create a look that’s cosy, roomy, sleek, modern, or completely out of the ordinary, custom window coverings are a great way to achieve the aesthetic that you want. If you’re worried about how much it might cost, don’t be. Custom-made doesn’t have to cost you the Earth. We pride ourselves in offering some of the best prices in the Toronto.